For the past two days Elizabeth has had the benefit of taking part in a fetal pig dissection. Though this, for me as I remember, happened in Grade 12 Biology class it was a "carpe diem" kind of choice to go and be part of the class. The instructor, a retired 30 year Biology teacher, guided the students through the process of dissection and examining the parts of the fetal pig. 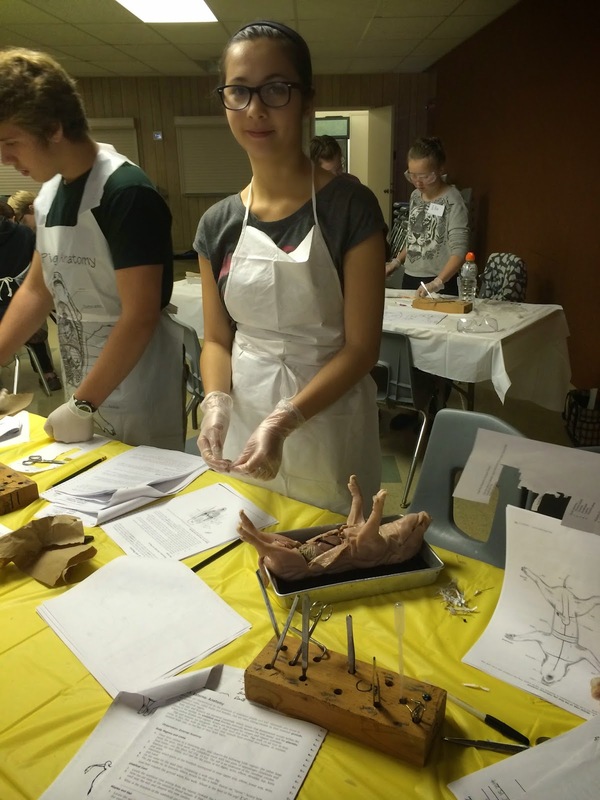 They had alot of freedom to explore over the two days, but it was rushed to learn about all of the parts of the pig and each section of the dissection process. Some of the students were adding on a third day, which would have been great, but we had to head home. It was great to see Elizabeth and her lab partners work together on this project. It became Dr. Jonah and Nurse Elizabeth forging ahead with their patient "Leonard". I think they all learned alot about anatomy from this, as well as many of the processes and skills that this type of lab work provides. It was a great opportunity and well worth the drive! !